Venezuela’s President Nicolas Maduro won’t be ousted by a referendum because there will be no referendum, Vice-President Aristobulo Isturiz has said. Two weeks ago, opposition politicians began the process by handing in a petition signed by 1.85 million people. However, Aistobulo Isturiz said the opposition had “acted too late, had done it wrong and had committed fraud”. Members of the opposition have previously warned the referendum may be hard to push through, as they alleged that the National Electoral Council (CNE) is staffed by government loyalists. Many Venezuelans blame President Nicolas Maduro for the economic crisis the country is experiencing. Venezuela’s economy contracted by 5.7% last year and is expected to shrink further this year. Inflation is at 180%, according to official figures, and there are shortages of medicines and basic food items. 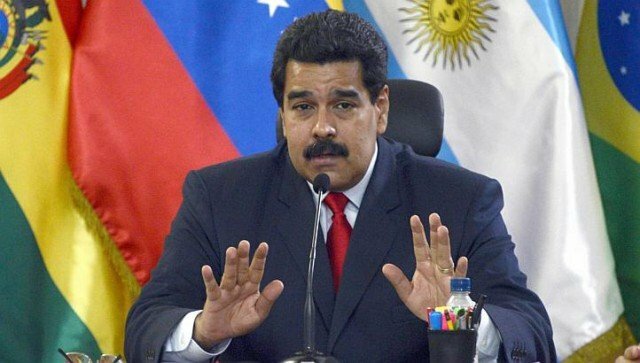 On May 13, Nicolas Maduro declared a state of emergency to “denounce, neutralize and overcome the external and foreign aggressions against our country”, which he blames for Venezuela’s economic problems. Nicolas Maduro did not specify what powers the state of emergency would give him except to say it would offer Venezuelans “fuller, more comprehensive protection”. On May 2, opposition politicians handed in 80 boxes containing 1.85 million signatures to the CNE, well above the 1% of voters on the electoral roll needed to kick-start the process. Opposition politicians say the authorities are trying to stall the process and have called on their supporters to march to the offices of the CNE on May 18 to demand they verify the signatures so the process can go ahead. The timing of a potential recall referendum is key because the outcome could be radically different depending on when it is held. Under Venezuela’s constitution, if President Nicolas Maduro were to be removed by a recall referendum in his last two years in office, he would be replaced by his Vice-President, Aristobulo Isturiz. However, if Nicolas Maduro were to be recalled before that, new elections would be triggered. The opposition sees it as essential to have new elections rather than have Aristobulo Isturiz take over power, as he is seen as a loyal member of Nicolas Maduro’s Socialist Unity Party. For new elections to be held, the recall referendum would have to go against Nicolas Maduro before January 10, 2017.